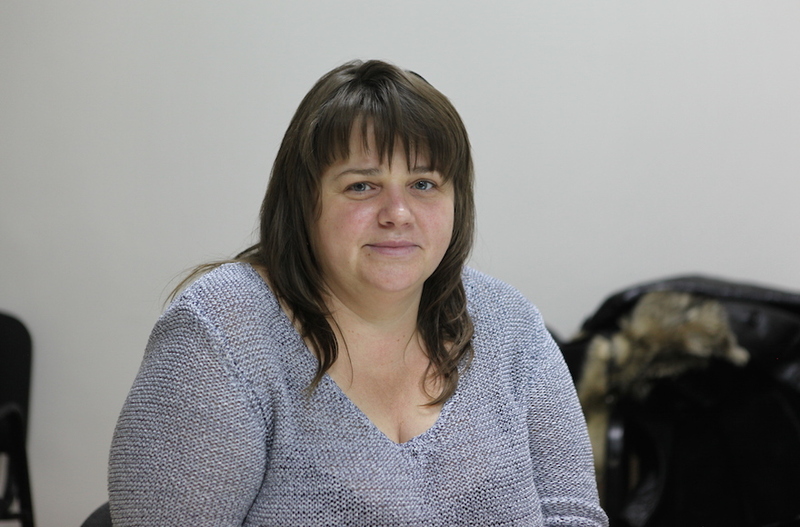 BERSHAD, Ukraine (JTA) — Olga Levus didn’t set out to revolutionize the Jewish community of her native Moldova when she opened its first-ever support group for single mothers. Unemployed and living in the city of Chisinau, she was mostly concerned 17 years ago with feeding and clothing her three boys in one of Eastern Europe’s poorest countries. The club she had established in 2000 “was mostly to survive,” she told JTA in a recent interview ahead of International Women’s Day, on March 8. Her initiative, which started as a support circle comprising six women, has evolved to become Moldova’s Jewish Family Service – an organization with funding from the American Jewish Joint Distribution Committee, or JDC, that is key to the community’s viability. The organization, which serves 331 families, offers financial and material assistance, after-school activities for children and community-building events for parents. Across the cash-strapped countries of the former Soviet Union, such assistance is helping Jews make ends meet. In Moldova, in particular, it serves as glue keeping the community together. The extra help allows breadwinners to avoid leaving the country permanently or to become migrant workers — a widespread phenomenon in this landlocked country sandwiched between Romania and Ukraine. Moldova has a high unemployment rate and an average monthly salary of $300, and there’s limited welfare assistance from the government. When Levus and her husband divorced in 2001, she was struggling to buy baby formula for her 1-year-old twins, she said. She became a recipient of food packages from JDC. “There I met families in similar situations, so I suggested we help each other and started organizing joint family dinners where we shared ingredients and swapped clothes to save on expenses,” Levus said. The group met almost daily for meals in the former offices of JDC’s Hesed charity. “We supported each other in those very Jewish dinners and it helped materially and also mentally,” she said. Approximately 1.2 million citizens of Moldova, one of Europe’s poorest countries with a domestic population of 3.5 million, live abroad, according to a 2015 study of the country’s emigration problem by the German Economic Team. Of those, half a million workers send most of their salaries back home to support their immediate relatives. Most Moldovan Jews left for Israel and North America after the fall of the Soviet Union, Levus said. This wave of emigration left the community severely depleted, with roughly 20,000 members remaining out of 80,000. Levus could have followed suit. But having discovered her Jewish-Moldovan identity only in 1991 – her parents kept it a secret during communism – she decided to try to stick it out. Levus said she felt duty-bound to her grandmother, who lit Shabbat candles in secret during communism and later taught the rest of the family Jewish traditions. She also has three children who attended the Jewish school here and felt connected to a Jewish community that had nearly disappeared. “I wanted to stay and raise them here,” she said. Children living without parents in Moldova are often sent to the streets to beg, or sell junk alongside the elderly in marketplaces where no piece of equipment is deemed too used to resell, from rusty faucets to tattered jeans. Most Jewish children in Moldova are raised by at least one parent, according to Levus. They are also eligible to attend after-school activities five days a week, which include homework tutoring provided by Jewish Family Service. The organization serves some 1,000 children. Other JDC programs care for 3,000 elderly, meaning that approximately one-fifth of the local Jewish community receives some form of aid. Igor and Tatiana Bekker, unemployed parents from the city of Bender 35 miles east of Chisinau, also known as Kishinev, said in a video JDC produced last year that they would not have been able to feed their five children if not for the Jewish Family Service. The organization provided another crucial form of aid, in the form of hope. Igor explains he lives with his family in a two-room space. They share a communal kitchen and shower with other tenants of the dilapidated apartment building they call home. “I want to give them everything I never had: a college education, a more dignified future,” he says. Levus was able to put her oldest son, now 24, through professional training at ORT Herzl, one of two Jewish high schools in Chisinau. He now works as a chef at a local restaurant. Her twins, aged 16, also attend the school, which is considered one of Moldova’s best. Through the single mom club she started, Levus also found her calling. She became increasingly involved in community outreach and, in 2003, JDC hired her to work for the Jewish Family Service, which she has headed since 2007. Irina Zborovskaya, JDC’s special projects director in the FSU, said that the 14 different programs at the Jewish Family Service run by Levus include some of the most successful ones of their kind in Moldova. Levus last year bumped into a former Jewish Family Service aid recipient in downtown Chisinau. Three years ago, the woman and her husband were unable to find work and had trouble feeding and clothing their children. They were about to emigrate when they turned to Levus’s group as a next-to-last resort. It helped through a rough patch and both found work; she is now a hotel manager. The grateful woman obtained permission from the hotel’s owner to give the Jewish Family Service a 50-percent discount — and the organization held a seminar there last year. “It was a nice reminder that whatever you give, you will get back,” Levus said.